A reflex is defined as an involuntary, unlearned, repeatable, automatic reaction to a specific stimulus which does not require input from the brain. The muscle stretch reflex is the most basic reflex pathway in the body and as such, understanding this allows understanding of more complex reflexes. This article shall discuss the components of a reflex arc, the monosynaptic reflex and relevant clinical issues. 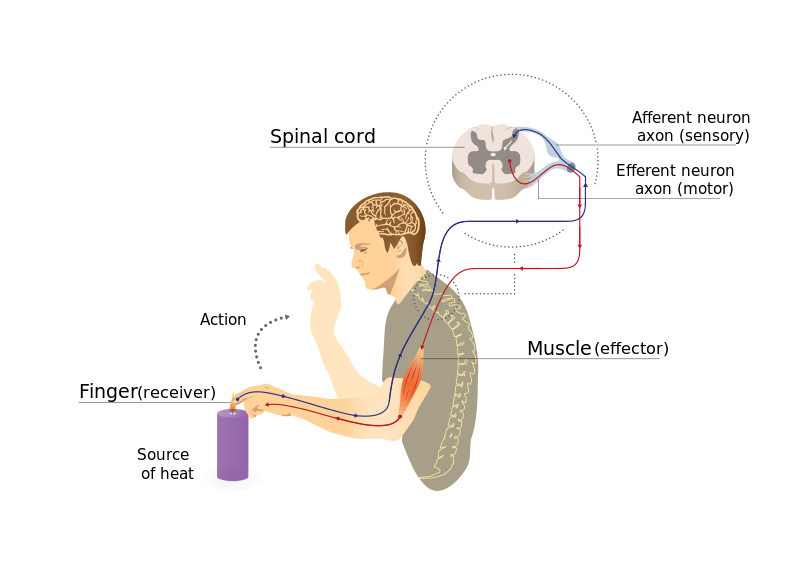 fig 1 – Diagram demonstrating the components of a reflex arc and the reflex response to a heat source. A monosynaptic reflex, such as the knee jerk reflex, is a simple reflex involving only one synapse between the sensory and motor neurone. The pathway starts when the muscle spindle is stretched (caused by the tap stimulus in the knee jerk reflex). The muscle spindles are responsible for detecting the length of the muscles fibres. When a stretch is detected it causes action potentials to be fired by Ia afferent fibres. These then synapse within the spinal cord with α-motoneurones which innervate extrafusal fibres. The antagonistic muscle is inhibited and the agonist muscle contracts i.e. in the knee jerk reflex the quadriceps contract and the hamstrings relax. 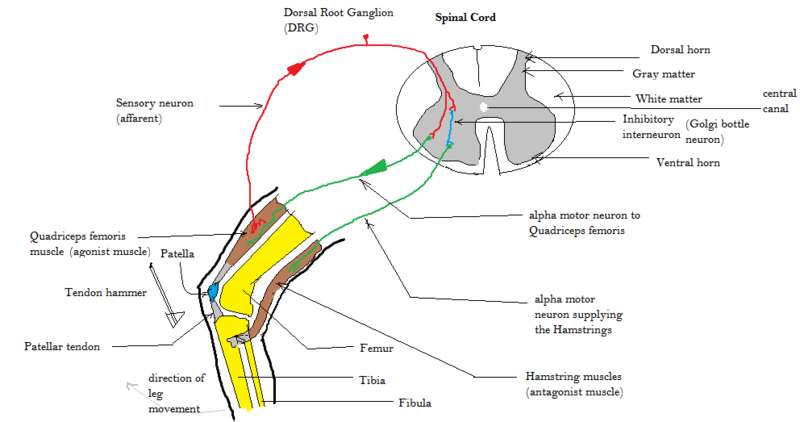 The sensitivity of the reflex is regulated by gamma motoneurones – these lead to tightening or relaxing of muscle fibres within the muscle spindle. It is thought that this takes place to allow preservation of the stretch reflex when muscles are contracted, although not much is known about it. Fig 2 – Diagram showing the muscle stretch reflex using the knee jerk reflex as an example. When testing reflexes it is important to know which spinal root level you are testing. The strength of the reflex can be graded from 0 (no response) to 4+ (clonus) with 2+ (brisk response) being normal.